The baby blue original Velox grips on my 1947 Camille Daudon were faded, dry, cracking and incomplete. I usually love to re-use all original equipment on any vintage bicycle I restore, but these grips were damaged beyond repair. 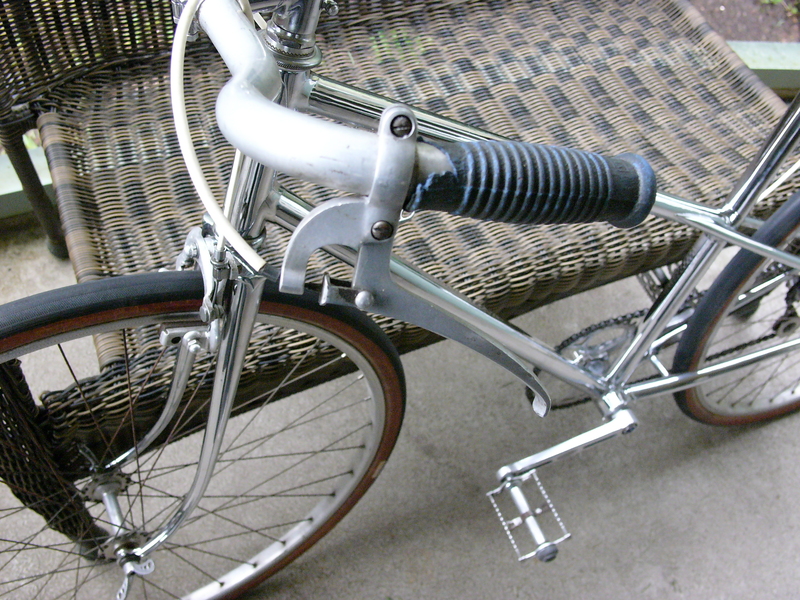 Earlier period vintage bicycles sometimes feature wood grips, which require a different algorithm for restoration and replacement. The Daudon’s grips were rubber, and so I searched the internet for a suitable replacement. I was lucky to find these French NOS Felt grips which matched the shape of original Velox grips exactly. The blue color is very vibrant, and is a little bit lighter than the color of the original grips, which have faded and darkened over time. The Daudon’s Stronglight crankset features matching blue highlights. Even the crank bolt is colorized. When I restore or “preserve” any vintage bicycle, I do my best not to ruin any original parts or accessories in the process. I wanted to remove the original grips without damaging them. Parts that I remove and replace are kept for a future owner of the bicycle. That’s the best way to document a bicycle’s provenance. 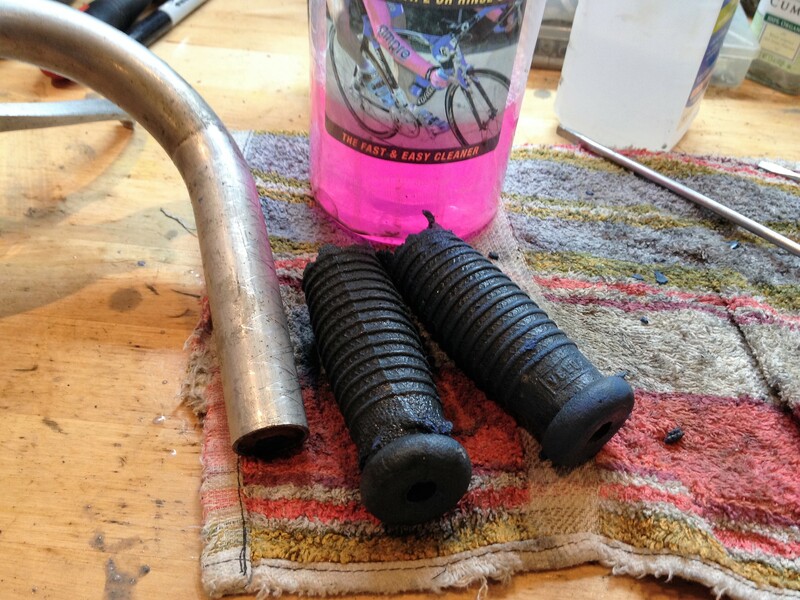 Using a surfactant, in this case Finish LIne’s pink bike wash, is the best way to soften the dry grips and begin the removal process. 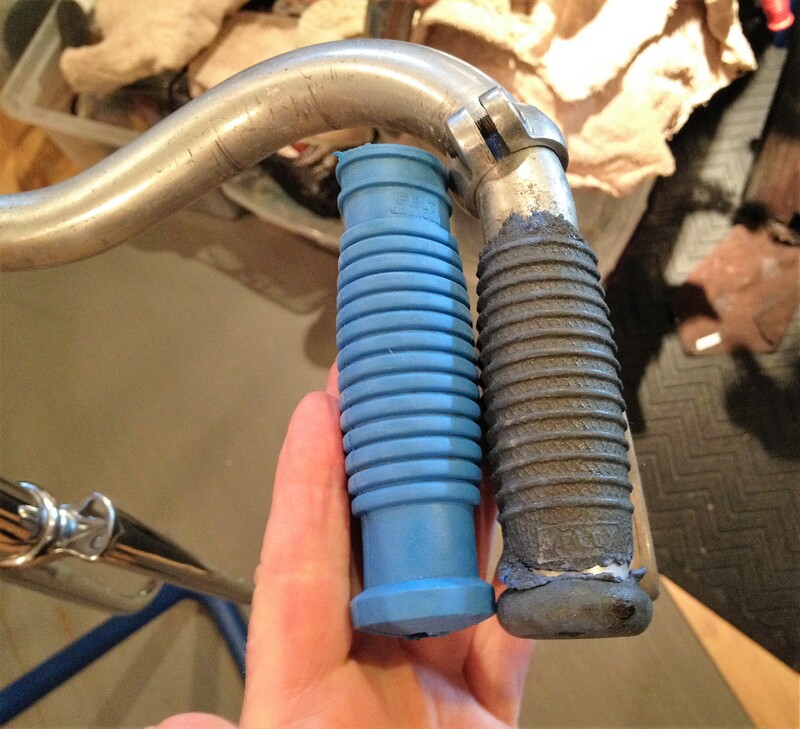 By slowly and carefully inserting the blade of a small narrow screwdriver, and then spraying the bike wash into the opening, the dry grips began to soften. After about 1/2 hour of this process I was able to remove both original grips intact without destroying them. For installing the new grips, I will use that most mysterious of products: hairspray. An adhesive not to be messed with. Before that, I will remove the brake levers and stem from the alloy bar, clean and polish all the parts, and then put everything back together. 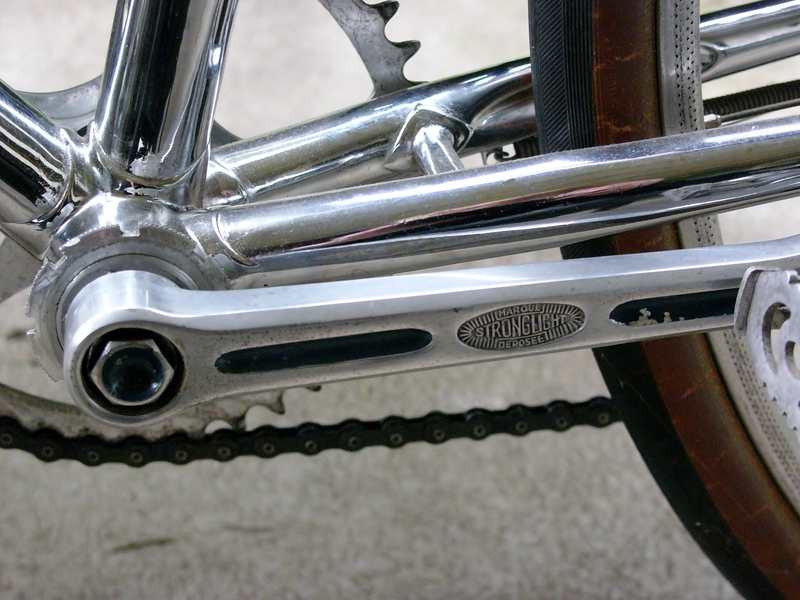 This bicycle’s stem mounts directly to the steerer tube, and is fashioned from lugged steel, chromed, with sets of 8 mm mounting bolts on the stem and steerer sections. The Daudon’s levers are alloy, but unbranded. 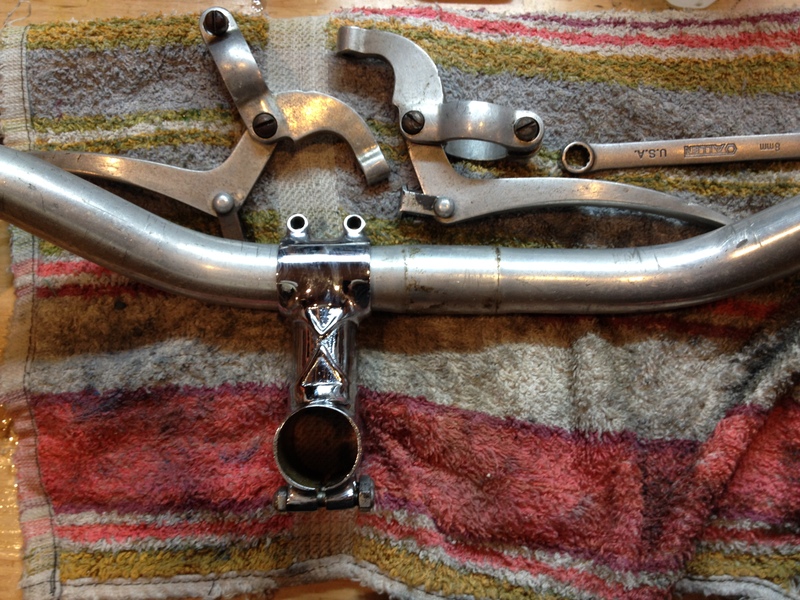 The handlebar assembly will be lovely and functional when completed, and then I can move on to the rest of the restoration process. 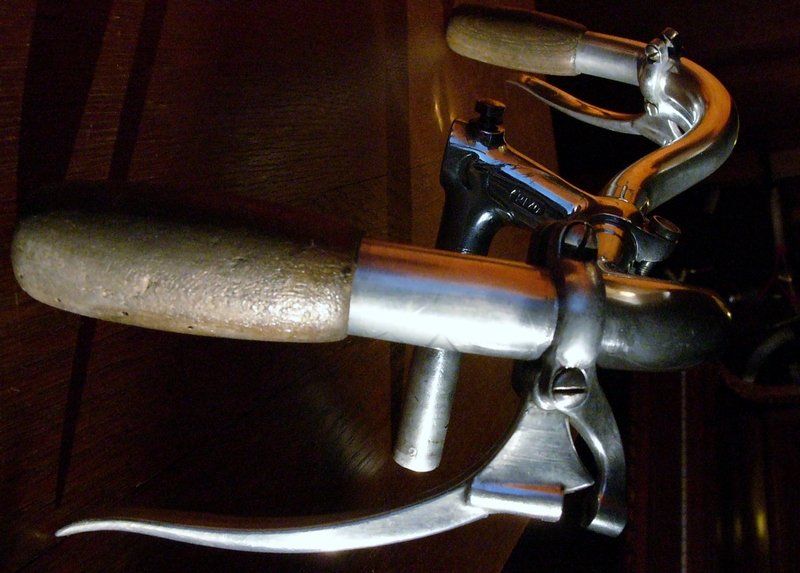 This entry was posted in 650B, Bicycle restoration, Camille Daudon, French bicycle and tagged Bicycle grips, Camille Daudon, Grenoble grips, replace grips, Velox Grips by Nola Wilken. Bookmark the permalink. Where did you find those replacement grips? They look nice. 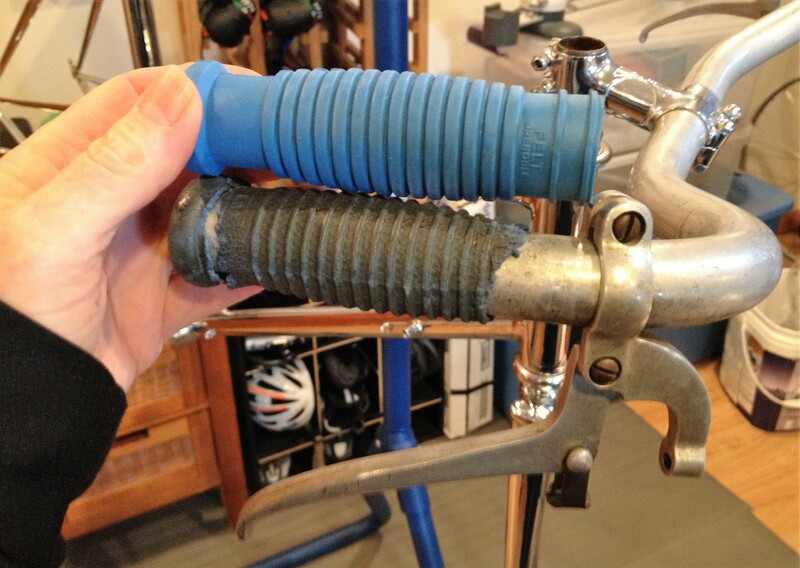 A similar grip is the Rustines that Velo Orange sells. I’ve got them on a couple bikes. These are NOS French grips, purchased on French ebay from seller retronaute123. The grips were made in the 1950’s in Grenoble, France (south and east of Lyon), but I’m not sure of the manufacturer. Thank you, Joe. We’ll see about this bike’s “spirit” – something to look forward to. Sorry for the comment, but I’ve never seen handlebar grips being glued before. Maybe rubber vintage grips are different from current ones? When working on more modern bikes I don’t need any glue since friction is good enough to keep them in place. I just squirt alcohol to ease installation, and once it dries they don’t move. But again, the oldest bike I’ve worken on was from 1972. I’ve stopped using screwdrivers and started using black nylon spudger tools (aka spludger tools) for grip removal. These non-marring tools came about as a way to open smartphones, ipods, etc (for battery replacement) without damaging the case. 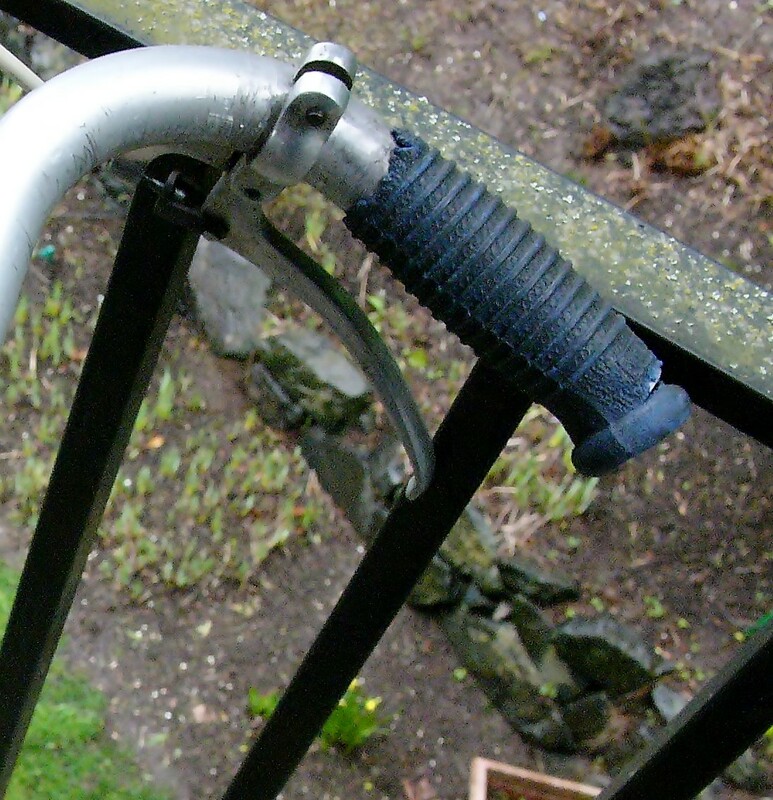 The tools help to avoid scratching handlebars (when inserted between grip and handlebar). I also use them to scrape off caked on grease from derailleur pulleys. The pointy end is also useful for opening up / rounding out cable housing after cutting.